X, 473 p., 12,2 x 19,4 cm. Translated from the French by Susanne Schaper. Preface by Volker Gerhardt and Wilhelm G. Jacobs. 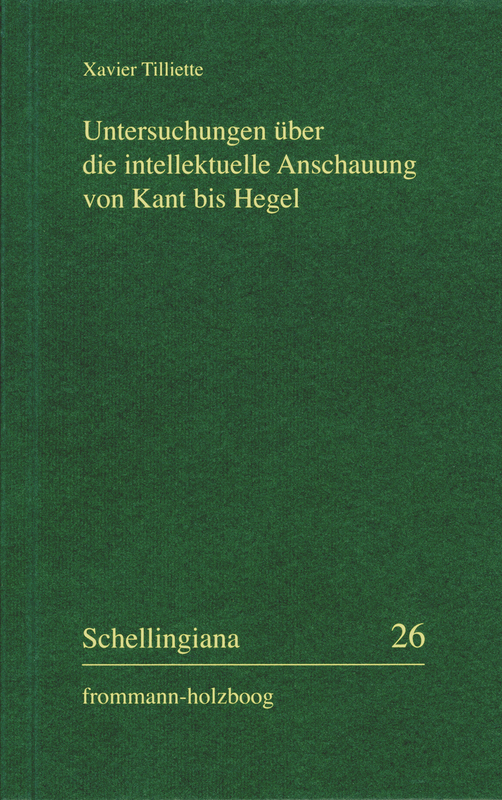 The discussion concerning intellectual intuition culminated during the time between Kant and Hegel. And yet the expression »intellectual intuition« conceals the majority of those terms which it describes. It is by no means unimportant who uses this expression, often not even in which stage of his thinking he uses it. Thus the interpreter always has to ask himself a second time what exactly is meant by this expression. The ambiguity of the expression is based on the fact that the question under discussion, the question of the foundation of all knowledge, is pivotal for philosophy and thus has been answered correspondingly controversially. Tilliette looks into the history of this question, which had not been posed for the first time or answered around 1800, drawing on the concept of expression for guidance, and describes it by philosophizing historically with French charm.